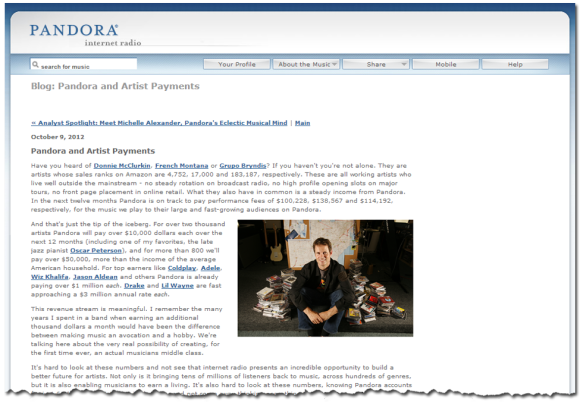 According to Westergren’s post, Pandora is on track to pay $10,000 each to over 2000 artists, $50,000 each to over 800 artists, and millions of dollars (between $1 and $3 million, but when you get that high does it really matter?) to artists such as Coldplay, Adele, Wiz Khalifa, Jason Aldean, Drake, and Lil Wayne. In fact, Westergren states that artists whose sales rank on Amazon very low - such as Donnie McClurkin (4752), French Montana (17,000), and Grupo Bryndis (183,187) – will each earn over $100,000 from Pandora performance fees this year. In other words, it’s unlikely that artists are making $10,000 - $3 million from Pandora – this money is, of course, divvied up among a number of people, including the artist, the record label/copyright holder, and SoundExchange, which is a non-profit performance rights organization that collects and distributes royalty fees from Internet radio services.